What is the difference between ginger syrup and ginger beer? Ginger syrup is made by cooking ginger with water and sugar until you obtain a syrupy consistency (see recipe below). Meanwhile ginger beer is traditionally a fermented beverage created by mixing ginger syrup (once cooled) with a mother culture (ginger beer plant) and leaving this mixture to ferment for a few days. The process for making ginger beer is very similar to the process for making other popular cultured and fermented drinks, such as Kombucha and water kefir. Once you learn to make one, it will be easier for you to start making other drinks. Just be sure not to keep the fermenting drinks close to each other or else the cultures can cross-contaminate the other drinks. I first got hooked a couple years ago making kombucha. Then about a year later I started making water kefir. Making your own drinks can become quite addictive, so watch out if you have a compulsive personality. In general each time you make a new batch of drinks, a new mother culture will be created. Therefore, you can either very quickly multiply your own supply or you can share the cultures with your friends and encourage them to get started making their own drinks. If you are interested in making cultured drinks or food, I’d highly recommend your looking at the site Cultures for Health. It’s a wonderful resource and provides many free very helpful e-books that will teach you how to create your own cultured products. I’ve followed their e-books for sourdough (which I also have growing in my kitchen), kombucha, kefir, vinegar and yogurt. Cultures for Health also sells culture starters if you need them to begin your journey. I have not personally purchased any cultures as I’ve been able to create my own starters by following the steps described in their e-books or other resources on the Internet. However, if you want to be sure that you begin this new process with a quality starter, Cultures for Health is a reliable quality supplier. Although the term ginger beer traditionally refers to a fermented drink with traces of alcohol, today ginger beer is often used for non-alcoholic drinks, usually carbonated, made with simple ginger syrup. Even Martha Stewart’s recipe for Homemade Ginger Beer is really just a ginger soda drink similar to a homemade ginger ale with some fresh lime or lemon juice. Therefore, if you want to try traditional ginger beer read the label first to make sure it is actually a fermented drink prepared with a live culture. 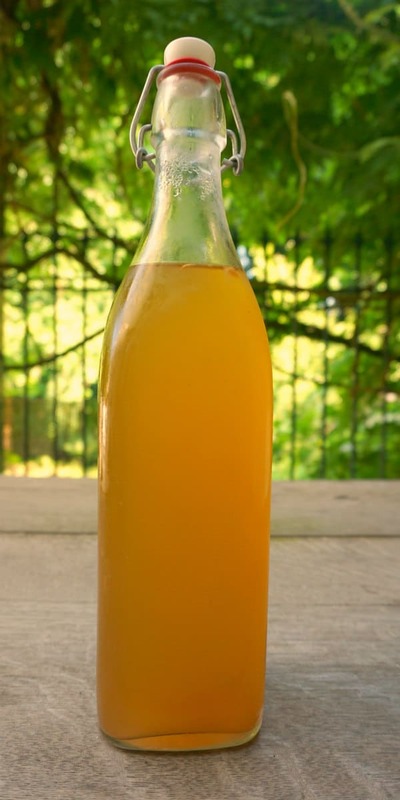 I often use ginger syrup in recipes calling for ginger beer and get pretty much the same final results, except of course without the health benefits that come with drinking a naturally cultured drink, such as ginger beer. How can you use Ginger Syrup this summer? Ginger syrup can be added to your cocktails this summer. Replace ginger beer with ginger syrup in cocktails, such as a Moscow Mule, merely by adding some club soda to give the desired carbonated effect that comes with ginger beer. So instead of mixing vodka, ginger beer and lime juice to create a Moscow Mule, you’ll need to mix vodka, ginger syrup, lime juice and club soda. You’ll be so happy to discover this easily-prepared drink since it is so refreshing on a warm day. An alternative made with gin instead of vodka is also delicious. A non-alcoholic version prepared with club soda, ginger syrup and lime juice (or lemon juice) will also be an instant winner. At my nephew’s wedding a couple years ago, I was asked to prepare a non-alcoholic version in a large punch bowl for the guests to drink with their appetizers. Although there were other beverage choices, people seemed to gravitate towards this refreshing ginger drink. Add ginger syrup to your ice teas, hot teas, fruit salads, ice cream sundaes, morning porridge, and any other food or drink that can use a hint of ginger. It can also be added to savory dishes, such as stir-fries, baked chicken, roasted carrots, to name a few. How Long will Ginger Syrup Last? Depending on how you make your ginger syrup, it will only last a few days in the refrigerator. See the notes below in the recipe concerning storage. This summer, I’ve started making ginger syrup ice cubes (putting the syrup in ice cube trays) to help the ginger syrup last longer. It’s also a lifesaver for those moments when you want a drink with ginger syrup yet have not made any in advance. Make as many ice cubes as you like and store them in plastic storage bags. Your ginger syrup ice cubes can add a special touch if you prepare them in a shape mold. I’ve been using a silicone tray of heart-shapes to put a smile on someone’s face. Or why not use the ginger syrup diluted with some water (about 1/5 syrup for 4/5 water) to make frozen shot glasses. You can then fill your frozen shot glasses either with alcoholic or non-alcoholic beverages for those extra-hot days. I usually recommend adding about 1/5 of a glass of syrup to 4/5 of other liquids, but the proportions are a matter of taste. It might also depend on how sweet you make your ginger syrup. I tend to use less sugar so the syrup is less thick and less sweet (yet plenty sweet for me). Feel free to experiment and find the proportions that are right for you. When I’m offering ginger syrup as part of a cocktail hour, I usually let people mix their own drinks so they can make it as strong or light as they want. Let me know what you think of my ginger recipe. I’d love to hear how you use it this summer. Send photos with the hashtag #belgianfoodiegingersyrup. A ginger-flavored syrup that can be used to make drinks and food. It takes about an hour to make and needs to be used within about 3 days. Slice the ginger in coin size pieces. There's no need to peel the ginger in advance, unless you are using non-organic ginger or prefer a lighter color. Put the ginger and the water in a pot over a high heat on the stove. Once the mixture begins to boil, reduce the heat and continue simmering for about 45 minutes in a covered pot. Remove the ginger pieces from the hot mixture by straining the liquid through a sieve, preferable covered with a cheesecloth to catch any remaining sediment. Put the liquid back in the pot and add the sugar. Heat the sweetened liquid over a low-to-medium heat for about 10 minutes or until the consistency begins to thicken. You can continue heating this mixture longer if you prefer a thicker syrup. Let the syrup cool down completely before putting it in sterilized glass containers for storage in the refrigerator. Once cool, use as desired! As mentioned above, I prefer a less sweet version of syrup. The sugar enhances the ginger flavor and makes it more tasty in the same way sugar brings out the flavor of mint in mint tea. If you prepare your syrup as described above, it will last a few days in the refrigerator before developing sediment that can turn bad. However, if you prepare the syrup with 5 cups of sugar instead of 3, you will get a thicker consistency and the added sugar will help preserve your syrup longer (up to 2 weeks in the refrigerator). Filtering out all the sediment before putting the syrup in a container for storage will also help you conserve your product longer. Note that the serving size used for the nutritional label below is 1 cup of ginger syrup. 1 cup can be used for more than 6 long drinks and more than 12 cocktails, depending on the amount used.